The air tasted clean and faintly salty in the morning light. Town houses stood shoulder to shoulder along the canal, painted in ochre and salmon and buttermilk yellow, their crisply white window frames like eyes overlooking the cobbled streets below. Houseboats bobbed on water the colour of sea glass, moored along the banks. People with clear skin and yellow hair rode past on bicycles, wrapped in wooden scarves and hats, chatting and laughing as they wheeled by. As March arrived, we had been feeling a little stagnant. Our feet were itching, our backpacks gathering dust under the stairs, and we yearned for the taste of a new city. 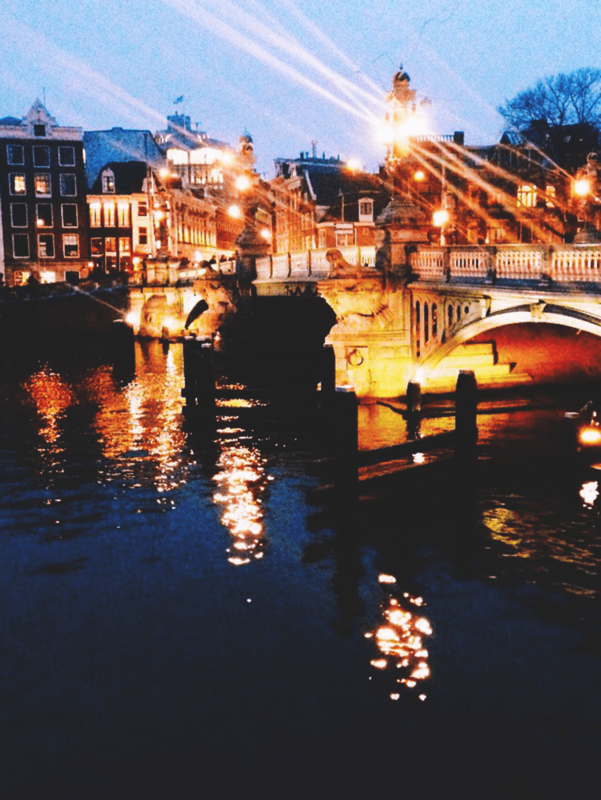 Impulsive flights were booked, and we stood a week later on a tiny bridge in Amsterdam, shivering with excitement in the cold, smokey morning. With only two full days in the city we knew we weren’t going to get through all the major sites, and after a fruitless hour spent queuing to get into the Rijksmuseum – where we were immediately corralled into another queue to buy tickets – we quickly decided to forget the tourist traps and explore Amsterdam our way. Which means that I did almost none of the things that you’re supposed to do in Amsterdam, but I did eat an enormous amount of cheese, which in my book is always the right decision. Here’s how I filled two days in Amsterdam. We stayed in an Air BnB apartment for our weekend in Amsterdam, in the Rivierenbuurt district. I often like to stay in residential areas for weekends in European cities, as these areas can offer the opportunity to immerse briefly into a local life style, a different travel experience to staying in a central hotel. We made friends with an elderly neighbour who told us stories from her 50 years living in Amsterdam, bought wine and supper from a local supermarket and got to people watch from neighbourhood cafes, gaining a glimpse into local life in Amsterdam. Flowers. Canal. Boats. 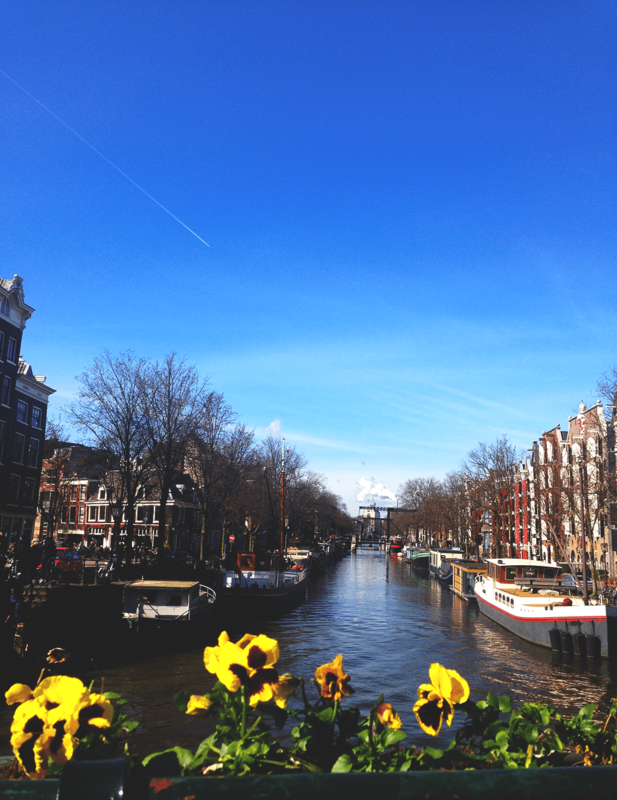 Amsterdam – nailed it. I love walking through a new city. Exploring at ground level brings the opportunity for adventure and spontaneity, getting lost and finding hidden facets of a place that you would never see from the tourist trail. 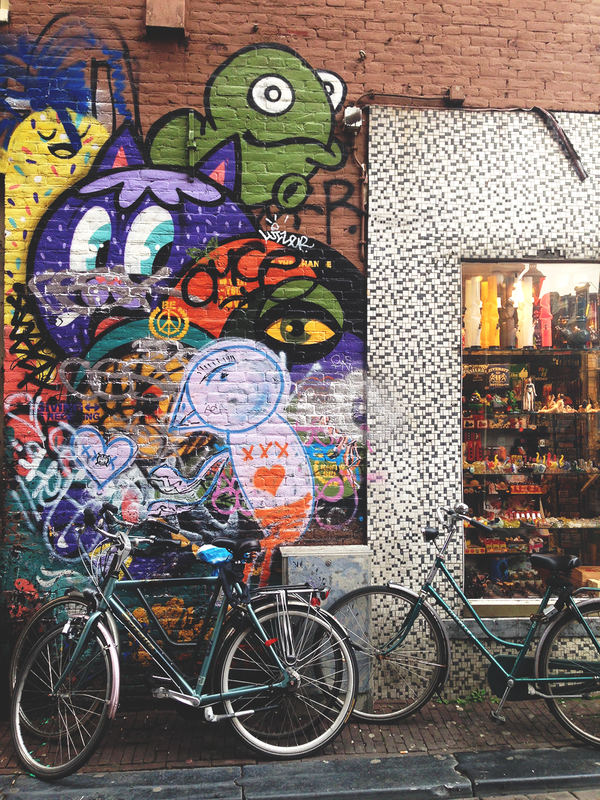 Amsterdam is compact and we easily walked everywhere, discovering the distinct characters of each neighbourhood, from eclectic De Pijp to quirky Jordaan. We wandered down residential streets and through local Sunday markets, along the canals and through the streets of Chinatown as the sun dipped pink and grey in the sky. 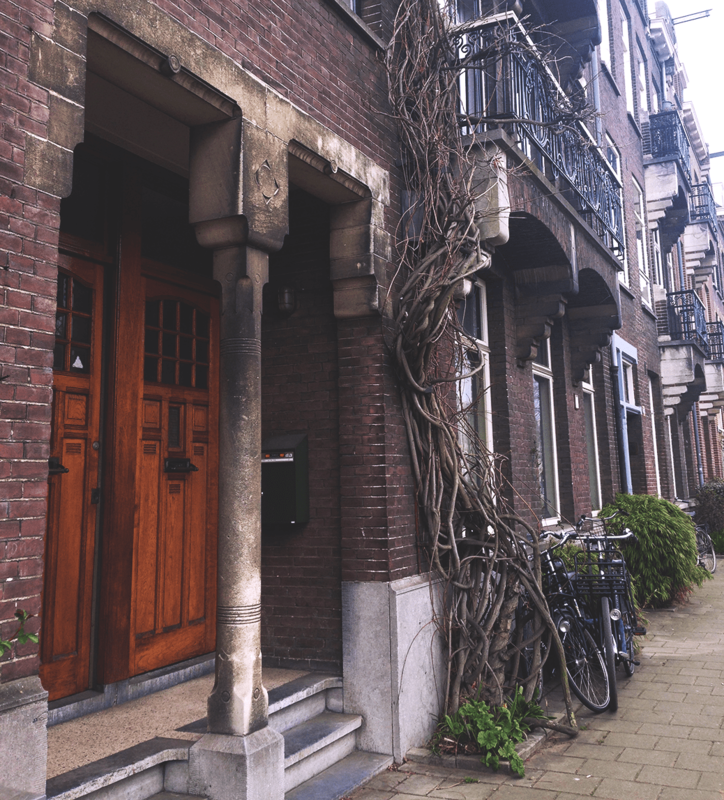 Our apartment was located in Rivierenbuurt, near De Pijp, and from there we walked leisurely into the centre of Amsterdam each morning, taking detours along the way to explore hidden streets and stop for coffee or waffles. I’ve listed some ideas for directions in which to wander below. Wander through the streets of de Pijp, the ‘Latin Quarter’ of Amsterdam, and stop for breakfast and people watching at one of the quirky cafes, bars and restaurants that line its narrow streets. Explore the grand streets and green spaces of Museumplein, making stops at the Van Gough museum, Rijksmuseum and Stedilijk Museum if you feel inclined. Walk the canals and cobbles of de 9 straatjes (the 9 streets) and pick up some vintage bargains from the independent shops and boutiques. 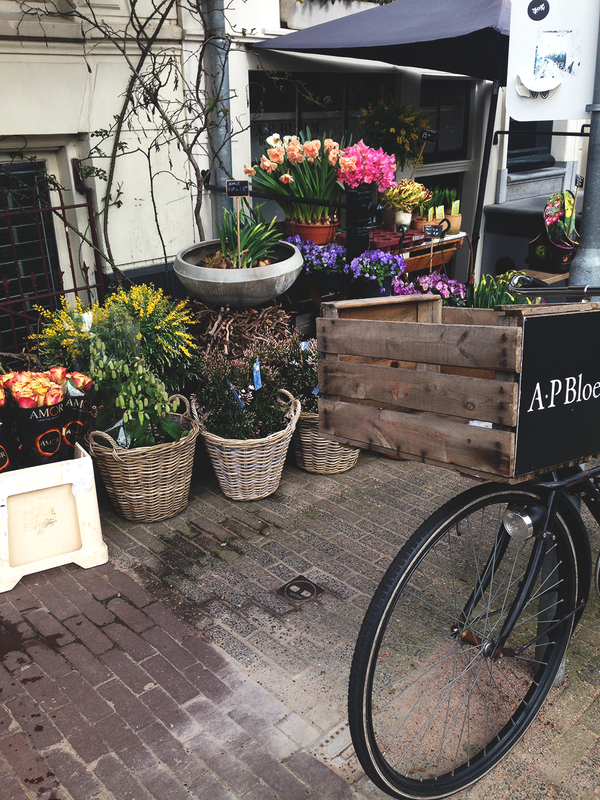 Shop for antiques and curiosities around Spiegelkwartier. Get lost in the streets around Rembrandthuis. Head for the three main ring canals that circle Amsterdam’s oldest streets – Herengracht, Prinsensgracht and Keizersgracht – in the late afternoon golden hour for canal photo opportunities. 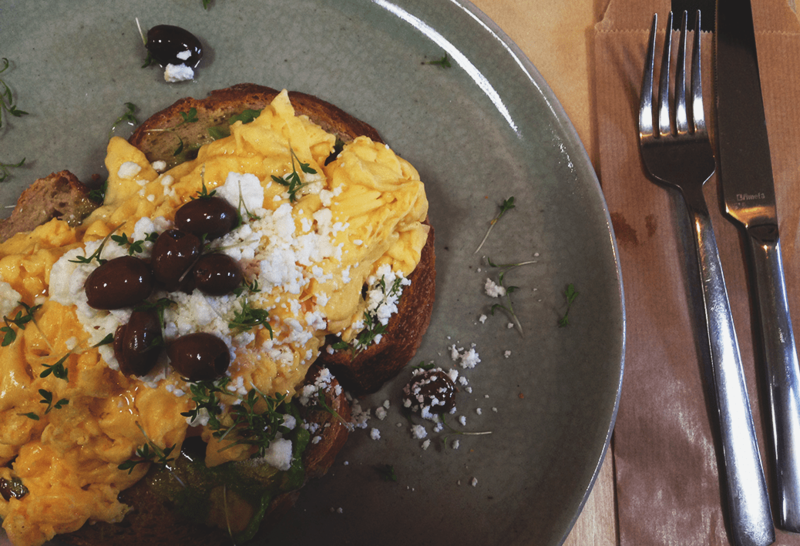 Scrambled eggs on rye bread with olives, feta, thyme and truffle oil – yes thanks. Pillowy, sugary, and drenched with melted white chocolate. The perfect street food. (I don’t have a picture of the waffles, because I ate them in about 4 seconds flat). Breakfast is my favourite meal, and Amsterdam has loads of options for lazy weekend brunch (the best kind of breakfast). We loved Coffee and Coconuts, a loft style hangout in a former 1920’s cinema full of people who look like they’re in an Ikea advert, that served fresh salads, tacos and eggs as well as their trademark coconut pancakes; and Omelegg, a tiny cafe with heavy wooden tables that churns out fluffy omelettes filled with farmhouse ham, gooey cheese and fresh crunchy vegetables from their open sided kitchen. Cheese shops line the streets in the centre of the city, selling Dutch gouda, creamy goat and sheep cheeses and hard farmhouse cheeses in every flavour from truffle to pesto to lavender. Most of them offer free samples of their cheeses, along with crackers, jams and pickles. 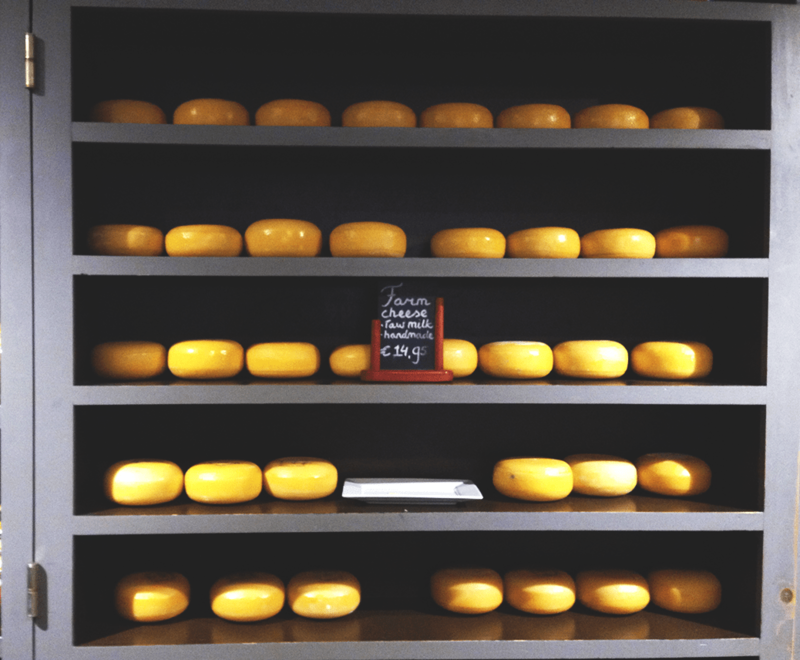 We saved money one day by substituting lunch with a free cheese crawl – but spent it a day later when we went back to buy enough cheese to see us through until Christmas. Golden, crispy and drenched in cheese sauce and mayonnaise – Dutch fries from one of the greasy little hole in the walls around the red light district may be the ultimate end-of-the-night snack. The famous floating flower market was a little bit disappointing – I didn’t actually realise that I was in the middle of it until Rikki pointed it out, although that could have had something to do with the fact that we’d just come out of a ‘traditional’ brown coffee shop. I’m told it’s more impressive in the summer though, when there’s more in bloom. However, on Sunday morning we visited the Albert Cuypmarkt in de Pijp which I did love, a bustling street market selling everything imaginable, the streets thick with the smell of perfume, marijuana and frying potatoes. We may have avoided the big ‘must sees’, but I loved the uncrowded and laid back FOAM photography museum, which has a reading room in the attic full of big books of photographs from previous exhibitions which you can thumb through, in addition to some beautiful and bizarre temporary collections. 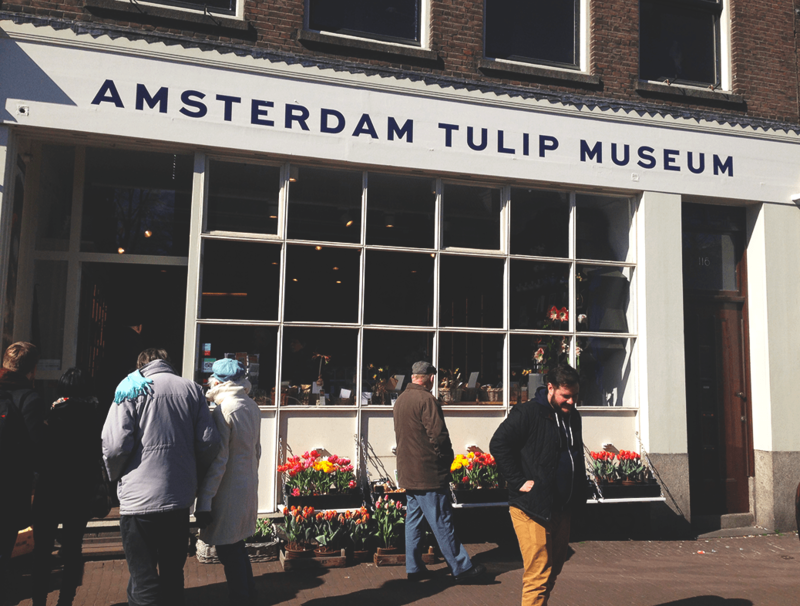 The Amsterdam Tulip Museum is also a good choice for an insight into an intrinsic part of Amsterdam’s culture without the queues and tourist crowds. I didn’t get to Ann Frank house during the time that I was in Amsterdam. That’s the one thing I really wish I had seen, but with four hours left before we went to the airport, we chose to explore Jordaan, eat breakfast by the canal and go cheese shopping rather than queue for three hours. It’s definitely worth booking tickets online – everything was booked up for us because our trip was so last minute – but the way I see it, it just means I’ve got a great reason to go back to Amsterdam as soon as possible. Have you been to Amsterdam? What are your top tips for a weekend in the city? Share in the comments! I live in Amsterdam, actually quite nearby the Rivierenbuurt, and I can confirm you have had the local experience :-). The things you did those two days are my favorite things to do in the city and that’s exactly how I spend my free time. Rivierenbuurt is lovely to stay and I’ve often walked to the city centre myself from there. So good to hear you have had such a great time and thanks for the breakfast spot, didn’t know that one yet! Next time you’re around drop me an email and I’ll be happy to show you more of Amsterdam’s hadden treasures. Great to hear that I got it right Ivana 🙂 I’ll definitely be back in Amsterdam so I’ll give you a shout! I really enjoyed reading your post. I’ll be traveling to Amsterdam this August so it was helpful in planning what I want to do during the two days I’m there. Your photos are really beautiful as well. Thanks Kara, I’m really glad you found it useful. I hope you have an amazing time in Amsterdam! Hi Monica, you’re so welcome! You will love Amsterdam, and I’m very jealous of your year in France – it’s somewhere I’ve always wanted to live for a little while. Have an amazing first trip overseas! Glad you enjoyed it, I hope you had an amazing time in Amsterdam! I hope they’re helpful Natalia, enjoy your stopover in Amsterdam! Hi Helen! I wish I’d seen Anne Frank’s house, so I recommend you don’t miss that – but book tickets online in advance and try and go first thing in the morning as the line to get in is huge later in the day. After that, go for some brunch at one of the lovely cafes scattered around the city – I made a couple of recommendations above but there’s loads of great places if you have a wander around. In the afternoon you might like to go for a canal-boat cruise – the view from the water is supposed to be one of the best ways to see Amsterdam. Walking around the antique shops at Spiegelkwartier is really interesting, and Leidseplein is a great place for a late afternoon drink on the cobbles. In the evening, get tickets for the ballet at Muziektheater and treat yourself to a nice dinner. The next day, I would pick either the Van Gogh Museum or the Rijksmuseum and dedicate the morning to that before you leave. Hope that helps, enjoy your trip! This is so helpful! Thank you so much.. I’m hoping to mimic your experience a few weeks from now! Great suggestions. Anne Frank House is my #1 site in Amsterdam, so I hope you get to go back to see it. I got there first thing in the morning to beat the lines. On my second trip to Amsterdam, I was addicted to the Vlaams Fritehuis (Flemish Fryhouse) for their fries. I had a great dinner at Garlic Queen, where yes, everything, including the ice cream has garlic in it. I had a good light lunch at Toastable along the Singel. I love Dutch tostis (grilled cheese sandwiches)! For something complete offbeat, there’s the Kattenkabinet, a cat-themed museum on the Herengracht. The Hollandse Schouwburg is a moving Holocaust Memorial i the Plantage. Burgermeester has great burgers served with corn on the cob instead of fries! Bird on the Zeedijk is a great Thai restaurant–a nice restaurant on one side and a more casual joint directly across the street. Enjoy!